Vigilant Tyranus is an Imperial witchblade encountered outside the Abandoned House in Markarth. 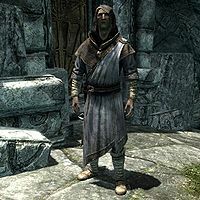 He is a Vigilant of Stendarr and as such, has dedicated his life to rid Tamriel of Daedra, wherever they appear. During the quest The House of Horrors his righteousness will be put to the test when he has to face the Daedric prince Molag Bal. He wields a leveled, unenchanted mace of the best possible quality and wears apprentice robes of restoration, a matching hood and a pair of boots. As a Vigilant of Stendarr he is also equipped with the proper amulet. He carries an assortment of common items and gold. He also knows several spells, specifically Sparks, Lesser Ward, Healing and Oakflesh. When you get near him, he will actively seek you out and ask the same question, saying, "Excuse me, but do you know anything about this house? Seen anyone enter or leave?" Three options are now available, all of them leading towards the related quest. If you say "Why are you asking?" he will introduce himself with, "I'm with the Vigil of Stendarr. We believe this house might have been used for Daedra worship. Evil rites and so forth." If you say 'no' or 'I'm not sure' he will say either, "Seems no one in this city has." or "Damn. It's like everyone in this city has amnesia." and will proceed to introduce himself. You can then choose to deny him any help which will make him say, "Thank you for your time." If you agree to help him out, he will invite you to come along inside and investigate the house with, "I was actually just about to head on inside. Be good to have someone watch my back. Follow me, and keep your eyes open. 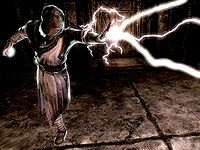 Daedra are powerful creatures and tricksters. Never know what you'll find." Inside the house, Tyranus will look around and comment on the interior with, "Fresh food. No wood rot on the furniture. Someone's been here. Recently. But the people I asked say no one enters or leaves...." A sudden sound will make him run away with the words, "Wait. Did you hear that? I think it came this way." Approaching him will net you one of two random lines, either, "Eyes open." or "Something's going on here." In the next room he will comment, "That's it. Something's inside the house. Come on, we're getting to the bottom of this." He will then run down the first set of stairs and approach the locked door, shouting, "Come out! We know you're here!" and will give you an order: "There's another door. See if you can get it open." If you talk to him, he will repeat, "See if you can get the door open." Tyranus will then reveal that he hears the voice as well, yelling, "Get out of my head, Daedra!" and "I don't want to die. I can't die here!" He will finally realize what he must do to survive and will draw his sword with, "The Daedra has us. It's you or me!" He will then lose his essential status and proceed to attack, leaving you no choice but to kill him to advance the quest and get out of the house. 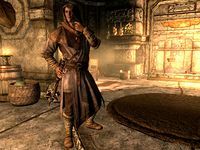 When first entering Markarth, Tyranus will not be present due to the Forsworn-related scene in the market. After the scene, exit and enter Markarth and he will spawn. He can go missing from his usual location outside the abandoned house. If this occurs he may reappear near the stables outside of the city. If your bounty is high enough in Markarth, he will attack you.